Bodacious Business Horoscopes: Swashbuckling Sagittarius! This staunch defender of independence (day, week, month…) pursues his or her personal freedom (regardless of relationship status) from November 22 until December 21. When you need a go-getter to rally the disgruntled, disenchanted or dismayed troops, a Sagittarius is your sure thing. Those bubbly Sagittarians you work with or employ are natural conversationalists. As such, they are the ones most likely to be your local, national or international road warriors, spreading the gospel of your business’s product or service (one story at a time). Sagittarius Is the Zodiac’s Mutable Fire Sign–Here’s What It Means for Your Business: Although Sagittarius isn’t a cardinal sign, its fiery qualities denote a business professional who doesn’t hold back when calling out bad decisions or implementing change. These peeps thrive when they have room to roam. Freedom’s Just Another Word for What Sagittarius Values Most at Work: One universal insight into the mind of Sagittarians: They tend to make an important career decision based on the amount of freedom/flexibility it grants them. In other words, your energetic Archers don’t fear walking away from a job opportunity or promotion that compromises this key need. Sagittarius is a natural wanderer; you’ll need to embed a miniature GPS device in the sole of one of his or her shoes. Best gifts for your Sagittarius señors and señoritas: A lifetime membership to Exodus, a sturdy pair of hiking shoes, the DVD of Sir Richard Attenborough’s Cry Freedom, an unusual book from a faraway place, and being asked to plan your company’s next team-bonding activity. The Archer’s Optimistic Outlook Can Boost Company Morale and Productivity: People whose sun sign is in the house of Sagittarius are the happiest employees and leaders on the block (and at your company). If this zodiac sign’s positive disposition can’t cure a fellow workmate’s “case of the Mondays,” consider it a hopeless cause. Your Sagittarians’ most positive traits: honest and fair-minded, optimistic, sees the best in others, enthusiastic (with a capital “YES!”), open to the unexpected, doesn’t hold grudges. Whether related to you by blood or non-disclosure agreement, Sagittarius was born to motivate your company’s downtrodden staff or unraveling project when you need inspiration most. Sagittarius is the business world’s equivalent of The Unsinkable Molly Brown! Good Luck Getting a Sagittarian to Commit to You Forever…: All zodiac signs have their negative traits, and Sagittarius is no exception. Yes, count on your exuberant Archers to push your company’s agenda to the brighter side of success, representing you well while out of the office. But be advised: As the zodiac system’s primary “wanderer,” Sagittarius can’t be contained by even the finest corporate benefits and perks. Don’t ever restrict an Archer’s freedoms in the workplace to a windowless room. By doing so, you beckon the dark side of this happy traveler’s persona. Less-than-stellar traits associated with Sagittarius: impatience (these birds gotta fly! ), doesn’t always plan adequately, denies emotions, doesn’t like commitment, rejects a responsibility that curtails freedom, can be blunt and argumentative. Give a Sagittarius a Position Requiring Travel and S/He Will Give You Increased Profits: It’s no coincidence that the Archer’s wanderlust propels many Sagittarians toward careers that include opportunities to travel. Some of the more obvious professions inhabited by many a Sagittarius: photographer, importer-exporter, ambassador and/or politician, travel agent (d’oh! ), and business development (national, international–doesn’t matter!). Additionally, Sagittarius’s love of learning and languages predispositions this sun sign to a teaching or research career. Tony Hsieh, a man who continues to disrupt “business as usual” as the founder and CEO of Zappos (it all started with shoes)! A Completely Speculative Business Interpretation of Sagittarius’s Astral Assets: Here’s something you don’t see every day–a business interpretation of a zodiac sign’s ruling planet, lucky day, lucky numbers, and primary colors. 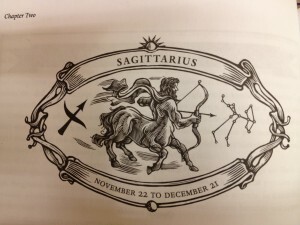 Final Snide Commentary on Sagittarius the Archer by the Author of Born on a Rotten Day: My favorite acerbic astrologer, Hazel Dixon-Cooper, considers a business ruled by a Sagittarian akin to a psychological comedy entitled The Keystone Cops Meet Frasier Crane. Does Sagittarius the Archer rule your birthdate? If so, did this profile trigger any disagreeable head-shaking from you regarding accuracy? What other interpretive traits would you add to this zodiac sign from a business perspective? For those of you with a birthday dwelling in another house, it’s possible I’ve already sliced, diced, and served up your zodiac sign’s profile in a previous blog post. (I’ve been doing this since June 2015!) Toward the end of December, I’ll finish the year with everyone’s favorite astrological goat, Capricorn.